Qigong (pronounced chee gong, also spelled chi kung, simplified Chinese: 气功; traditional Chinese 氣功) is an umbrella term in use since the late 1940s for an enormous variety of traditional Chinese body-mind-breath cultivation practices. They have their origin in Daoist, Buddhist, martial and medical traditions and range from simple quiet meditative sitting through to tough training to harden the body for martial arts. Qigong is made up of two characters. ‘Qi’ is often translated as energy, though really it’s untranslatable as it is used in hundreds of different ways in Chinese. ‘Life’ or ‘aliveness’ might be one way of understanding it. ‘Gong’ means skill. So qigong could be said to be training in the skill of living. 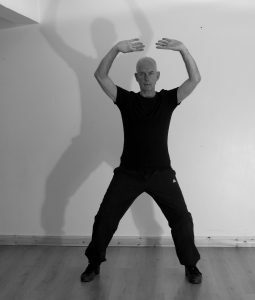 With so many different traditional roots, as well as hundreds of modern styles, qigong can vary enormously and going to a number of different teachers quickly reveals this. Qigong, like tai chi, does not appear at first to be much like exercise. It is usually practised so slowly and smoothly that it bears no resemblance to the intense, aerobic, sweat and exhaustion-inducing training we are more familiar with. Yet running or gym-type exercises, however wonderful they may be, are relatively limited in their aims, being mainly devoted to developing aerobic fitness and muscle strength. Indeed, as I write, an increasing trend is high intensity interval training which aims to offer these benefits in just a few minutes a day. Regular practice of the right kind of qigong will help achieve all of these (you can visit the qigong research page to see some of the evidence). What qigong won’t deliver (and other forms of exercise will need to be added to achieve these) is high levels of aerobic fitness or body sculpting. One of the most obvious characteristics of qigong (as well as tai chi) is the slowness of the moves. The reason is that when we slow things down (and repeat them over and over) we can become more deeply aware of the body, of how it does and doesn’t move, of how it does or doesn’t feel, of our balance and alignment. 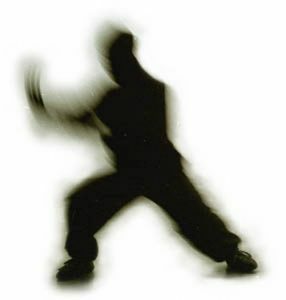 And the reason this kind of slow repetitive movement is also practised in what are called the ‘internal’ martial arts, is that finally – when speeded up – perfect biomechanics results in maximum connected power. When we practise qigong, it’s not only movement that we slow down but breathing as well. Slow breathing is harmoniously synchronised with slow movement. Qigong breathing is not just slow, of course. 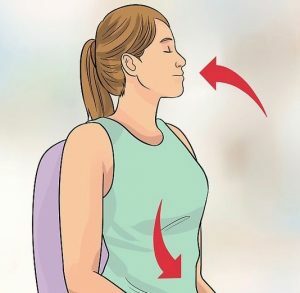 Although we make sure to breathe in through the nose, the skill is then to mentally take the breath right down to the lower abdomen and lumbar region (maximising descent of the diaphragm). To do this we have to relax the chest and forget about consciously using the lungs. The effect of slow breathing in this way is profound and affects our physical, mental and emotional state in extraordinary ways. You can view a brief introduction to the how of breathing here. The right kind of mental attention is crucial to the practice of qigong and our first aim is to cultivate mental presence so that the mind is fully absorbed in the body and the breath. It is common, especially in the early days of practice, to find this frustratingly difficult. The mind wanders off after a few seconds and we get lost in thoughts, plans, conversations we’ve had or should have had, and so on. It is important to be kind to ourselves and usher the mind back to the present in the same we would gently bring back a toddler who keeps trying to wander off. Slowly, the amount of time we are able to stay in awareness of body and breath will increase, and the deep reward of this triple cultivation will start to be experienced. It is also common that the slow breathing and slow movements of qigong can trigger feelings of frustration and irritation in beginners. In Chinese medicine terms, when we slow down and increase awareness, underlying stagnation is revealed. It would take too much space here to discuss the full meaning of this term, but emotional stagnation (a lack of free and easy emotional flow) can be more easily hidden or dispersed with general busyness and fast, aerobic movements. 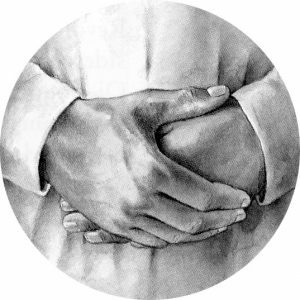 Focusing on specific parts of the body considered to be vital areas in the Chinese tradition, for example the soles of the feet (called Bubbling Well), the deep centre within the lower abdomen (knwn as the dantian or field of elixir), the centre of the lower back (called Mingmen), or the palms of the hands (called Laogong). Focusing on specific areas of the body to improve alignment and integration, for example feeling the links between the hands and feet, the knees and elbows, the hips and shoulders, feeling the way the weight of the body transmits down through aligned hips, knees and ankles, developing an ability to soften and relax the areas we move (for example by not tensing or raising our shoulders when we raise our arms). Focusing on areas of the body that are painful or tight and using the outbreath to soften and relax them, improving circulation in these problem areas. Focusing on the breath as it fills and empties within the lower core. Connecting down through the lumbar, hips, sacrum, legs and feet deep into the earth and complementing that by connecting up through the central channel and crown of the head into the sky. Especially when practising outside, connecting to the environment … earth, sky, air, sun, trees, sea, rivers, mountains etc. Mentally repeating phrases such as ‘relax’, ‘calm’, ‘healthy’ etc.